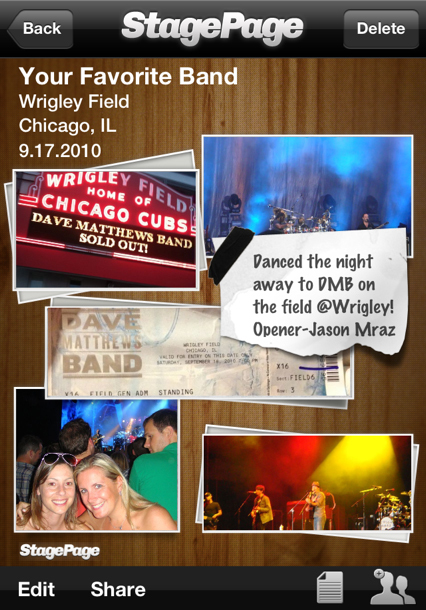 What if you could take all of your old ticket stubs from your past and create an online scrap book of them? What would that be worth to you? Imagine a place to put all your photo’s from concerts of your past with your friends to put in one place to keep the memories together…Well, now there is an app for that! StagePage uses the amazing photo editing software, Aviary. With this you can edit pictures and videos by improving the image quality automatically, adding effects, and more. Of course, after you have created your StagePage, you must share it with all of your friends. StagePage is setup to share via Facebook, Twitter, and email! StagePage is going to allow you to FINALLY clean out your junk drawer & toss all of those old school photo albums. I even found a cool video from the creator of the app that we can watch – very cool stuff!